“…Did a migrant document his journey to Europe on Instagram? Did a young Syrian boy save a friend from danger under a hail of bullets? Did a pair of magicians pull off the ultimate photobomb by performing a trick in the background of a news report outside the Houses of Parliament? EXCERPT “… We are especially concerned about the way recent trends in enforcement of non-existent prohibitions on photography and filming are affecting members of the press. This document is not intended to be an exhaustive examination of all laws as they pertain to photography and filming. The issue is complicated and depends to some extent on laws that vary from province to province and municipality to municipality. – photographing or filming police officers in public, as long as the photographer/filmmaker does not obstruct or interfere with the execution of police duties. While everyone has a reasonable expectation of privacy in certain circumstances, police officers have no reasonable expectation of privacy as they go about their duties. A police officer does not have the right to confiscate cameras or recording equipment (including phones), unless the person in possession of such equipment is under arrest and such equipment is necessarily relevant to the alleged offence. A police officer cannot force anyone to show, unlock or decrypt cameras or recording equipment, or to delete images, even when that person is under arrest, unless the police officer has a warrant or a court order permitting him to do so. At no time, and under no circumstances, is anyone in Canada subject to arrest for the simple act of taking a photograph or filming, although he or she can be arrested if he or she is breaking another law in the process, such as, for example, trespassing or breaking or entering. Reporter John McFadden by Walter Strong. The CJF Aboriginal Journalism Fellowships offer two Aboriginal journalists with one to 10 years of experience the chance to explore issues of interest to First Nations, Métis or Inuit peoples. 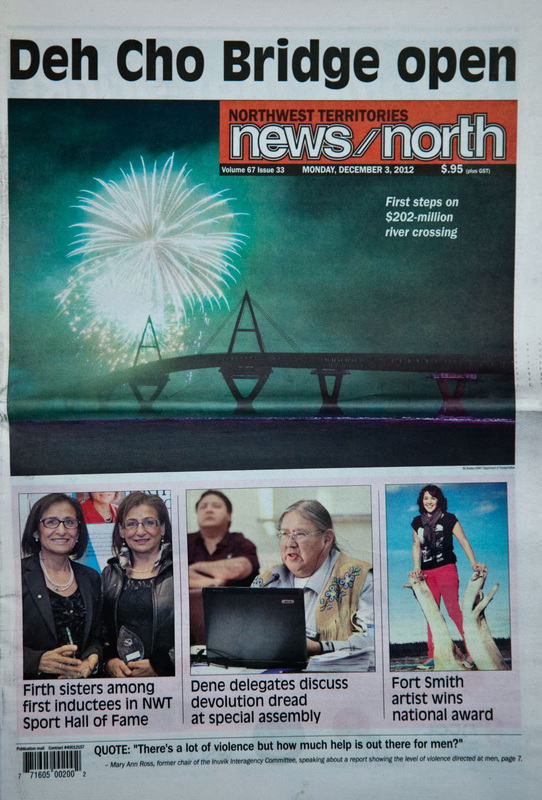 The award aims to foster better comprehension of Aboriginal issues in Canada’s major media and community outlets. “…This week, Ron Haviv described to me the first time one of his photographs changed history. The acclaimed war photographer was surrounded by his life’s work, which is now on exhibit in New York’s Anastasia Photo gallery. At age 23, Haviv took a photograph of supporters of Panamanian dictator General Manuel Noriega beating the country’s recently elected opposition vice president. via Pictures That Change History: Why the World Needs Photojournalists – The Atlantic. 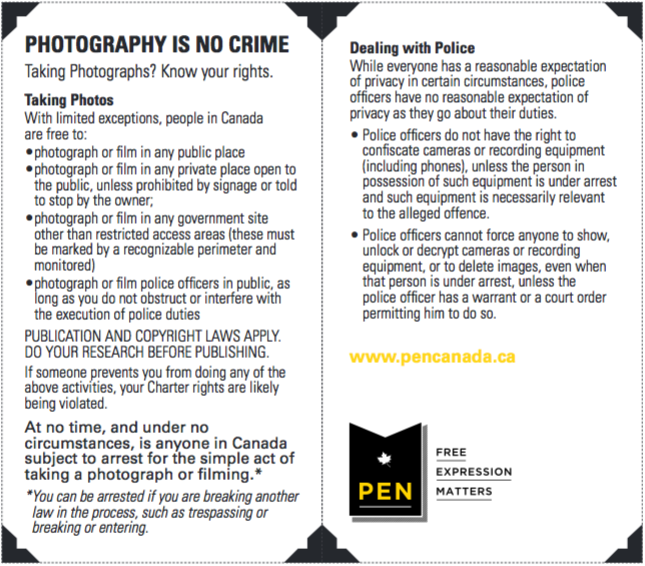 Public Photography is No Crime | PEN Canada. 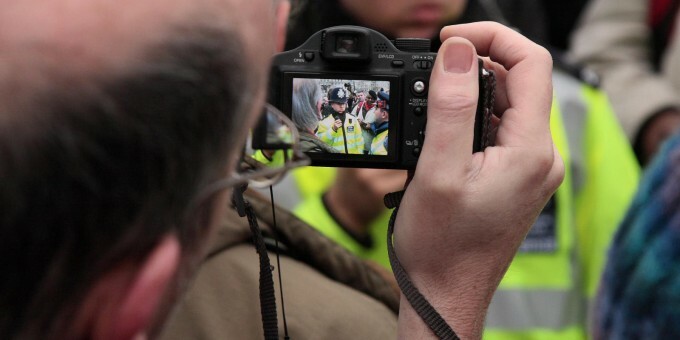 “…In particular, we wish to state that it is not a criminal offence for individuals to photograph or film police officers as they go about their duties, and that police officers are not allowed to confiscate a person’s camera or recording equipment (including phones), force them to delete images, or otherwise prevent them from taking photographs or filming in public places. We also wish to clarify the law when it comes to taking pictures or filming on private property that is open to the public. People are welcome to take pictures or film in malls, transportation centres, and the like, unless posted signs specifically prohibit it, or until they are requested to desist by a representative of the owners of the property. In such an instance, though the owners or their representatives (such as a security guard) are within their right to request a halt to any further photographic activities, they have no legal right to force the deletion or destruction of photos that have already been taken. The publication of these photos is a separate issue and may be affected by other applicable laws. We are especially concerned about the way recent trends in enforcement of non-existent prohibitions on photography and filming are affecting members of the press. The Great War on Photographers: A Dispatch From The Trenches. Karl Baden should have known better. 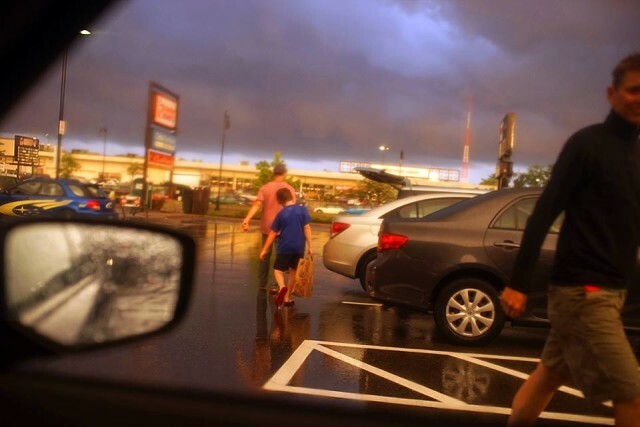 I mean, what was he thinking, casually snapping a few pictures as dramatic sunlight broke through the clouds after one of last week’s late spring rainstorms? From the front seat of his car in a suburban Boston Trader Joe’s parking lot, of all places? What is he, nuts? “… When the NWT’s Deh Cho Bridge opened just two years ago, on November 29 2012, it brought to a close over 50 years of crossing the Mighty Mackenzie by ice bridge and ferry. Here is a book for anyone who has ever floated on or driven across Canada’s longest river. Bridging the #Dehcho chronicles the history, colour and drama of the Mackenzie River Crossing at Fort Providence. From the days of the ancient Dene to the establishment of the community in 1870, to the arrival of the highway in 1960 and completion of the Deh Cho Bridge in 2012, the book also paints a contemporary portrait of the historic community of Fort Providence today. The hardcover, 92-page book presents over 200 photos and illustrations with principle photography and writing by Yellowknife author Bill Braden, and an opening essay by adventure writer Jamie Bastedo. It is published by the Government of the NWT, Department of Transportation, to commemorate the project. The public is invited to the official launch at the Fort Providence Community Hall on Wednesday Dec 3 at noon, with Transportation Minister Tom Beaulieu, Deh Cho MLA Michael Nadli and author Bill Braden. The book will go on sale (suggested retail $30) that day the Big River Service and Snowshoe Crafts in Fort Providence, and at the Yellowknife Book Cellar and Northern Frontier Visitors Centre. – Bridge Costs – the various costs of the Bridge, including an interactive calculator. – Bridge Summary – a basic overview of events. There’s also a timeline of the bridge project. Panoramic Landscape Photographer. Changing the world one photo at a time.